Polykote evolved from a passion to collaborate with customers to provide coated materials that exceed application performance requirements. We are committed to partnering with our customers to develop proprietary solutions to our challenging applications. Polykote specializes in producing materials with a unique coating, adhesive or construction. Our team of experts work with you to develop an optimal solution. We can use your materials, our materials or a combination of both. If your final product is a pressure sensitive label, we can help. 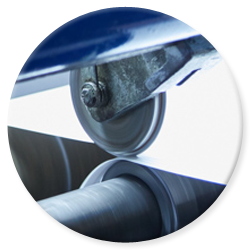 Not only are we able to adhesive coat, we can die cut and slit the product, offering a seamless manufacturing process from raw material to fully converted rolls of labels saving you time and money. Our customer-centric product development process begins with an analysis of your specific application. We won’t simply pull a product off the shelf or send samples of something that “might” work. Instead, we get to know you and your requirements. Not all coatings are alike – and neither are our coaters. Our broad range of coating equipment enables us to use the best tool for each job. With multiple coaters varying in specifications, you are guaranteed to receive a product that is produced in the most efficient and economical way possible. 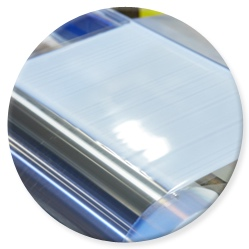 In addition to producing pressure sensitive laminates, many of our customers need multiple substrates permanently laminated together resulting in a durable, functional multi-ply material. We utilize our coaters to efficiently combine multiple webs into one. Our expertise goes beyond applying coatings. We are committed to getting you what you need in the configuration that works for you. 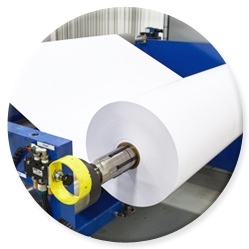 Polykote’s in-house slitting and sheeting equipment allows us to provide rolls or sheets that meet your requirements. 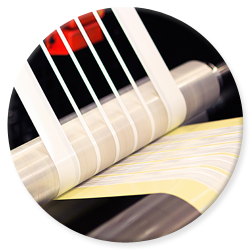 We can not only coat and laminate specialty label products, but we can convert those materials into finished label rolls. Three presses ensure orders will glide through the system minimizing lead times from ordering coating services to final product delivery. Need your coating applied to a specific material? No problem. Have an exclusive material you need a coated with adhesive or a functional topcoat? We can do that. Whatever the configuration, we can help.